Detects endogenous levels of CREB only when phosphorylated at serine 129. Synthesised phosphopeptide derived from CREB around the phosphorylation site of serine 129 (Human). The antibody was affinity-purified from rabbit antiserum by affinity-chromatography using epitope-specific phosphopeptide. The antibody against non-phosphopeptide was removed by chromatography using non-phosphopeptide corresponding to the phosphorylation site. Our Abpromise guarantee covers the use of ab47373 in the following tested applications. This protein binds the cAMP response element (CRE), a sequence present in many viral and cellular promoters. CREB stimulates transcription on binding to the CRE. Transcription activation is enhanced by the TORC coactivators which act independently of Ser-133 phosphorylation. Implicated in synchronization of circadian rhythmicity. Defects in CREB1 may be a cause of angiomatoid fibrous histiocytoma (AFH) [MIM:612160]. A distinct variant of malignant fibrous histiocytoma that typically occurs in children and adolescents and is manifest by nodular subcutaneous growth. Characteristic microscopic features include lobulated sheets of histiocyte-like cells intimately associated with areas of hemorrhage and cystic pseudovascular spaces, as well as a striking cuffing of inflammatory cells, mimicking a lymph node metastasis. Note=A chromosomal aberration involving CREB1 is found in a patient with angiomatoid fibrous histiocytoma. Translocation t(2;22)(q33;q12) with CREB1 generates a EWSR1/CREB1 fusion gene that is most common genetic abnormality in this tumor type. Belongs to the bZIP family. Contains 1 KID (kinase-inducible) domain. Stimulated by phosphorylation. Phosphorylation of both Ser-133 and Ser-142 in the SCN regulates the activity of CREB and participates in circadian rhythm generation. Phosphorylation of Ser-133 allows CREBBP binding (By similarity). Phosphorylated upon DNA damage, probably by ATM or ATR. Sumoylated by SUMO1. Sumoylation on Lys-304, but not on Lys-285, is required for nuclear localization of this protein. Sumoylation is enhanced under hypoxia, promoting nuclear localization and stabilization. 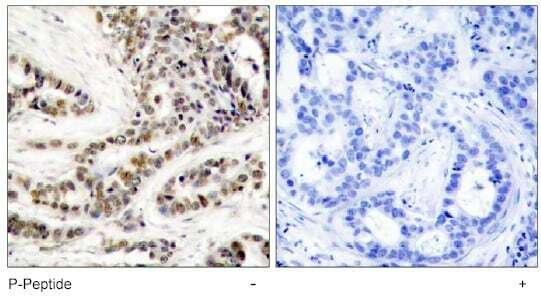 Immunohistochemistry (Paraffin-embedded sections) using human breast carcinoma tissue and ab47373 at a dilution of 1/50. ab47373 has not yet been referenced specifically in any publications. Publishing research using ab47373? Please let us know so that we can cite the reference in this datasheet. There are currently no Customer reviews or Questions for ab47373.